On Sunday, October 15, 2017 the Friends of Carlington will host a Clean Up the Capital campaign at Carlington Park at 1 pm. If you’ve got an hour to spare, come and join us! All you need to bring is your enthusiasm (and perhaps some sturdy shoes or boots depending what the weather’s doing that day), the Friends will supply everything else. At 2 pm, after the clean up, join me on a walk to discover some of the weird and wonderful plants that call Carlington home. If you’ve ever wondered what that green thing is coming up in your yard, you just might find the answer. 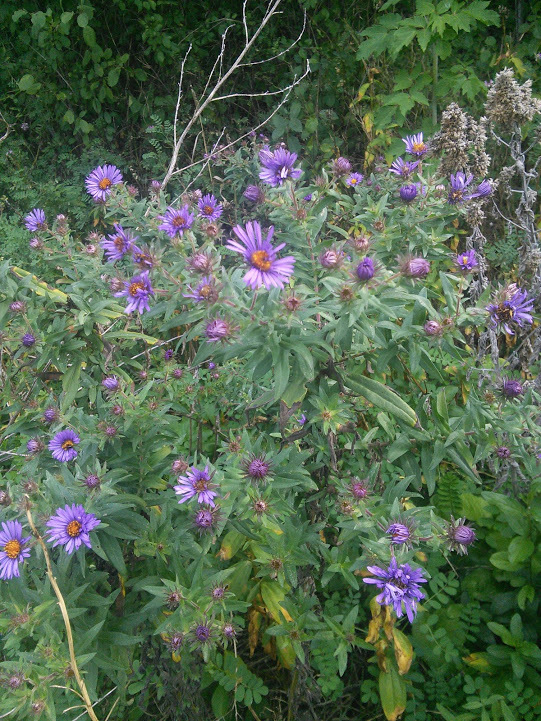 The root of New England asters (pictured here and commonly found in Carlington), has been used for centuries in Chinese medicine to treat pain and fever. The flowers and leaves are also edible and can be added to salads. In fall, make sure the plant is dry, then cut the stem 10 cm (4″) above ground, hang upside down in dark cool place till dry. Add dried leaves and flowers to main dishes, or steep for tea. Flowers can also be used to make natural dyes.